BEN FIORE is a multiple award winning, New York based screenwriter. A retired NYC Police Officer, he also served in the now defunct, legendary New York City Transit Police Department, patrolling New York's infamous subway system. He is also the recipient of numerous top accolades and awards for his screenplays. Ben also worked the rescue and recovery mission at the World Trade Center during and after the September 11th, 2001 terrorist attacks. Ben enjoys spending time with his lovely wife, Marci, and their two sons, Stephen and Christopher. --Ben was recently asked to be the first prize judge for short screenplays in the 2019 Boomtown Film & Music Festival in Beaumont, Texas! Ben's short, "Condemned", copped the top honors for 2018 and the festival has invited him to judge the 2019 winner! --"In the Quiet of the Evening" Ben has teamed up with his old writing partner again, Raymond Izaac, of Los Angeles, to reintroduce their psychological thriller screenplay. The script recently won 1st Place honors in the 2018 Indie Suspense Horror Sci-Fi Film Festival! --"The Sunrise Man" Ben has teamed with European director Werner Schumann and Brazilian screenwriter and playwright, Altenir Silva, on this modern day Western, reminiscent of "No Country for Old Men". The script is currently being shopped to producers and A-list talent. --"Condemned" Ben's thriller short continues to be recognized by the film festival and contest circuit, recently copping a first prize genre award from The Hollywood Hills Screenplay Competition, September, 2017. --"The Mamaluke" TV Show project is currently being shopped to networks and streaming TV outlets. All inquiries from agents, producers and financiers are welcome! --"Blood and Loyalty" is a gritty dramatic thriller screenplay about two delinquent brothers who make a bad decision and a bizarre twist of fate that destroys their lives. --"DEEP BLUE: NYC Transit Police" is a crime drama TV series project, created by Ben and Mark Riccardi, about the now defunct NYC Transit Police Department which fought crime in New York's subways. --"Once Upon a Christmas Eve" is a feel-good Christmas drama feature screenplay about the selfless, heroic deed of a homeless man that brings a divided town together during the holiday. 10. L.I. INT'L FILM EXPO, "The Plan Doctor", (director), July 2010 (Garman Productions, LLC). 11. LONG ISLAND FILM FESTIVAL, "Penelope", (writer/director), August 2011, (Garman Productions, LLC). 1. "Blood & Loyalty"" (drama/thriller) A fatal hit-and-run getaway shatters two delinquent brothers. 2. "King for a Day" (drama/with Shawn Klush) A failing Elvis Impersonator gets inspired by The King. 3. "DEEP BLUE: NYC Transit Police" (drama TV series) About the NYC Transit Police. 4. 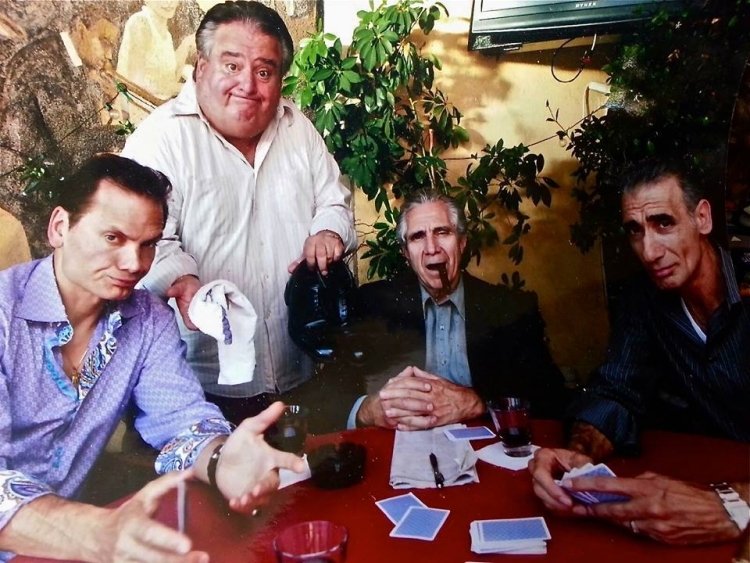 "The Mamaluke" (comedy TV series, with Mark Riccardi) A purported Mafioso and his family. 5. "Forbidden" (horror) The Mafia meets the supernatural. 6. "In the Quiet of the Evening" (thriller, with Raymond Izaac) A young woman's bizarre journey into insanity and murder. 7 "The Sunrise Man" (drama, with Altenir Silva & Werner Schumann) A modern-day Western drama. 1. "The Hit" (drama) Based on the award winning short screenplay about two doomed Mafia hitmen. 2. "Appointment with Death" (drama/thriller) A ruthless hired killer is forced to confront the spectre of his violent past in the form of his next victim. 3. "Traffic Stop" (drama) Tragic irony is the consequence in the shooting of an unarmed young man by an overzealous cop. 4. "The Plan Doctor" (drama) When two thugs decide to steal narcotics and rob patients at a doctor's office, they encounter more than they bargained for. 5. "Penelope" (horror) A troubled young woman's murky past come to the surface with the reappearance of an evil doll. 6. "The Interrogation" (drama) A corrupt police detective is hell-bent on framing an innocent man for murder. 7. "Eternal" (drama) A distraught widower contemplates suicide until 'divine intervention' saves him. Thanks for visiting. Please stop back soon to keep up with Ben!